In 1982, First Lady Nancy Reagan uttered the three words “just say no,” to a schoolgirl who had asked what she should say if someone offered her drugs. The first lady’s suggestion, as we all know, became the unified call for the adolescent drug prevention movement we have all come to know and may have experienced. Since that movement schools around the country have instituted programs that are designed to discourage alcohol and drug use among children and teens—most of them targeting older elementary school aged kids and some adolescents. And it is all for good reason. US surveys show that 24% of 12th graders had engaged in binge drinking in the past two weeks. And 42% had consumed at least some alcohol in the past month. 11% of eight graders, 28% of sophomores had tried alcohol as well. In addition, 1% of 12th graders had tried meth, and almost 3% had used cocaine in the past year. In an attempt to reduce these numbers, prevention programs will often let young kids know the perils and dangers of drug use, they will teach students social skills to resist pressure to experiment and they will help young people feel that saying no is socially acceptable. All the approaches seem to make total sense and teachers, parents, and policymakers alike believe it works. Yet, as it turns out, approaches that involve MORE social interaction work better than any kind of education. And that may be why one of the most popular prevention programs, which you may have experienced yourself, is such a failure—and may even heighten the use of some drugs among teens. The most widely publicized teen substance abuse prevention program is Drug Abuse Resistance Education, better known as D.A.R.E. 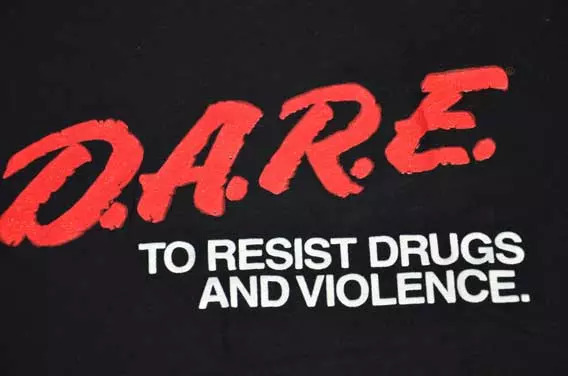 Created in 1983 by the LA Police Department, DARE asks uniformed police officers to go into schools to warn students about the dangers of drug use and underscore the highlights of living a drug free way of life. In most cases the officers do so once a week, for about 45 to 60 minutes, for several months. DARE is hugely popular, according to the program Web site, and it is in place in 75% of US school districts and 43 countries. There are DARE bumper stickers, DARE t-shirts, and police cars emblazoned with the word DARE are all familiar to all of us. Despite all of this “fanfare,” data indicates that the program actually does nothing to help with substance abuse among teens. A mathematical review in 2009 of 20 controlled studies by statisticians Wei Pan, then at the University of Cinninnati, and Haiyan Bai of the University of Central Florida revealed that teens enrolled in the program were just as likely to use drugs as were those who didn’t have DARE. Even worse, DARE programs might occasionally backfire when it comes to the use of drugs such as alcohol and cigarettes and for some drugs the chances of use are increased for girls. In a 2002 review psychologist and now president of PreventionPLUSWellness in Jacksonville, FL and Deborah Owen of the University of North Florida reported that those who went through DARE were more likely to drink and smoke compare to those who were not exposed to the program. Small negative effects for DARE like drinking and smoking were also reported by in a 2009 study by Public health professor Zili Sloboda of the University of Akron and her colleagues. The reasons for this are still unclear. Yet by emphasizing drug abuse as being bad they may unknowingly make cigarette smoking and alcohol drinking look better or less dangerous. These results are a slap in the face to the long held belief by teachers and even parents that DARE works. One reason for this is that teachers and parents may overestimate the prevalence of substance abuse among children. As a consequence they assume a decline in use when students of DARE abstain from drugs when really those children who didn’t have DARE have just as low rates of use, if not lower. The good news is that DARE is now recognizing the negative results and incorporating more potentially effective elements such as role playing and intervention. Research on the revised programs in DARE should tell whether it will make a dent in substance abuse or not.